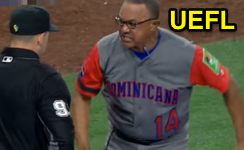 World Baseball Classic HP Umpire Will Little ejected Dominican Republic Manager Tony Pena Sr for arguing a strike one call in the top of the 8th inning of the Dominican Republic-Puerto Rico game. With one out and none on, Dominican Republic batter Carlos Santana took a 0-0 fastball from Puerto Rico pitcher Joseph Colon for a called first strike. Replays indicate the pitch was located over the heart of home plate and near the hollow of the knee (pitch f/x unavailable), the call was irrecusable. At the time of the ejection, Puerto Rico was leading, 3-1. Puerto Rico ultimately won the contest, 3-1. This is Will Little (93)'s first ejection of the 2017 World Baseball Classic. This is the 6th ejection of the 2017 World Baseball Classic. This is the 2nd Manager ejection of the 2017 WBC. Wrap/Log: Dominican Republic vs. Puerto Rico (WBC), 3/14/17 | Video via "Read More"